73X Faster Than a Speeding Bullet! On the night of Nov. 17, 2011, NASA cameras captured two super-fast views of Leonid meteors. The first video below shows a Leonid from a NASA camera operated in Tullahoma, Tenn. Moving 73 times faster than a bullet fired from an M-16 rifle, the three-quarter inch meteor first started to burn up 71 miles above the town of Nolensville, Tenn., and was totally vaporized over Franklin, Tenn., at an altitude of 54 miles. The fireball — which was slightly brighter than the planet Venus — was recorded not only by the Tullahoma camera, but also by NASA cameras at the Marshall Space Flight Center in Huntsville, Ala., Chickamauga, Ga., and Cartersville, Ga. The second video below shows the same meteor as captured by the wide field meteor camera located at the Marshall Center. Note how quickly it streaks across the 25-degree field of view – a mere bullet would never keep up with this Leonid! Author Marshall Space Flight CenterPosted on November 18, 2011 Categories UncategorizedTags General1 Comment on 73X Faster Than a Speeding Bullet! Leonids Meteor Shower Peaks Tonight! The annual Leonid meteor shower is expected to reach peak activity tonight, November 17, at about 10:40 p.m. EST. Leonid meteor showers occur when the Earth runs into a stream of small icy debris left behind by comet Tempel-Tuttle as it moves about the Sun. The best viewing opportunity is tonight after midnight, when the constellation Leo rises above the eastern horizon. Leonids can be viewed any place on Earth except Antarctica — given the sky is clear. “The moon is going to be a major interference, but we could see a rate of about 20 per hour,” said Bill Cooke, Lead of the Meteoroid Environments Office at NASA’s Marshall Space Flight Center in Huntsville, Ala. The Leonids occur each year in November. At 1:45 am MST on November 17th, NASA’s all sky camera at the New Mexico State University caught this image of a Leonid meteor streaking through the skies. Author Marshall Space Flight CenterPosted on November 18, 2011 May 23, 2013 Categories UncategorizedTags all sky camera, Bill Cooke, Leonid meteor shower, Marshall Space Flight Center, Meteroid Environment Office3 Comments on Leonids Meteor Shower Peaks Tonight! The Orionid meteor shower is over, as Earth has finally left the wide stream of debris produced by Comet Halley. However, we are now encountering particles produced by Comet Encke, the second comet to be assigned a name (Halley was the first). This debris wake is much larger, lasting many weeks, causing the Taurid complex of meteor showers — the South Taurids, which peak on October 10, and the North Taurids, which peak on November 12. Rates are low, only about 5 per hour, so why the interest? 1) Comet Encke is thought by some astronomers to be a piece of a larger comet that broke up 20,000 to 30,000 years ago. These comet break-ups are often caused by gravitational encounters with Earth or other planets — Jupiter especially is a bit of a Solar System bully. This break-up may explain why there are so many Encke-like pieces moving around the inner Solar System, some of them pretty big. One astronomer has even postulated that it was a huge fragment of Comet Encke’s parent that produced a 10 megaton explosion over Siberia back in 1908. 2) Taurid meteors tend to be larger than the norm, which means they are bright, many being fireballs. They also penetrate deeper into Earth’s atmosphere than many other shower meteors. For example, Orionids typically burn up at altitudes of 58 miles, whereas Taurids make it down to 42 miles. Some can get even lower — on the night of November 6, our meteor cameras tracked two 1-inch North Taurid meteors, both getting down to an altitude of of 36 miles. 3) Because they are big and possess a goodly amount of energy (imagine a 1 inch hunk of ice moving at 63,000 mph — 29 times faster than a bullet from an M-16 rifle), they produce decent quantities of light when they strike the surface of the Moon. This makes Taurid lunar impacts easy to see with Earth-based telescopes; in fact, the first lunar meteoroid impact observed by NASA was a Taurid back on November 7th of 2005, and we detected it with a 10″ telescope of the same type used by amateurs all over the world! 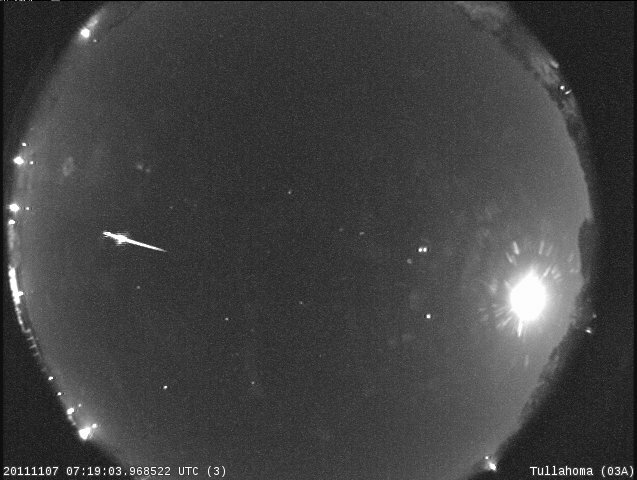 So when you are out at night this month, look up and watch for the occasional fireball – it’ll probably be a Taurid! P.S. Check out the last couple weeks of meteors seen on fireballs.ndc.nasa.gov and you will notice there are several fireballs that are associated with the Northern or Southern Taurids (NTA or STA). Don’t even have to go outside! A bright Taurid streaks across the southern Tennessee sky in this image taken by a NASA meteor camera in the wee hours of November 7, 2011. The same Taurid; the bright flare in the meteor about two-thirds of the way into the video is caused by the meteor breaking into smaller pieces. When this happens, energy is released, resulting in a flash of light. 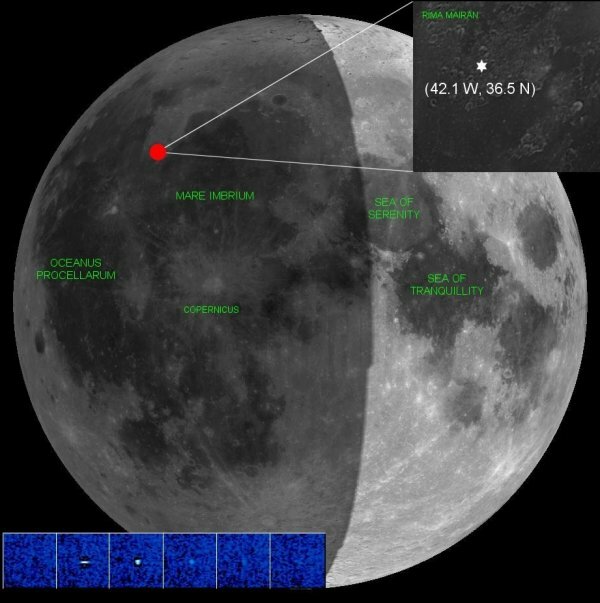 This graphic shows the location of the first lunar meteoroid impact observed by NASA on November 7, 2005. Originating from Comet Encke, it was a Taurid meteoroid striking the Moon’s surface with a speed of about 63,000 mph. The sequence of false color images at the lower left shows the impact flash as it evolved over consecutive video frames (1/30th second intervals). The colors of emitted light within an aurora depend on the initial energy of the charged particles (mostly electrons) cascading into Earth’s atmosphere. Electrons with higher initial energies are able to penetrate deeper into the atmosphere, whereas those with lower initial energies lose all their energy at higher altitudes. The blue aurora emitted from low-altitude molecular nitrogen is most commonly seen at higher latitudes, such as in Canada and Alaska, where high-energy electrons are more common. 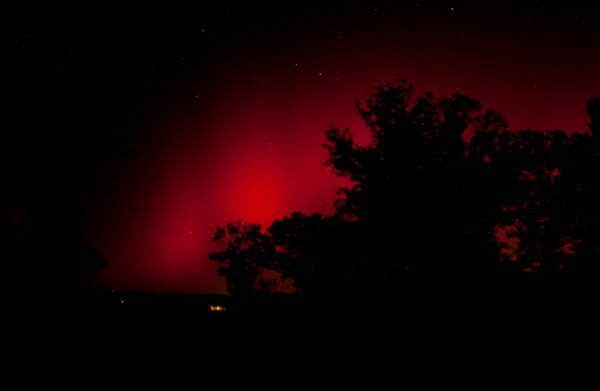 Red aurorae mostly result from lower-energy electrons reacting with atomic oxygen at high altitudes, which can occur at lower latitudes (<50 degrees) during extremely strong geomagnetic storms — such as is seen in images here. The auroral electrons that make it into the low-latitude atmosphere usually do not have enough energy to reach molecular nitrogen. This is why low-latitude aurorae are almost always red. From Athens to Tuscaloosa — In 3 Seconds! 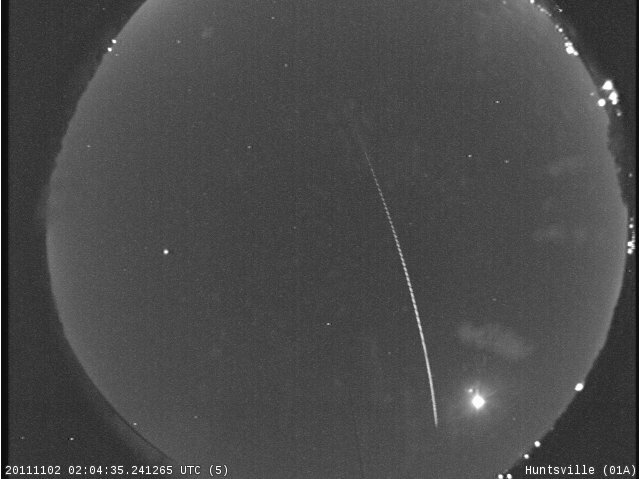 MSFC’s all sky meteor camera recorded this bright meteor last night (November 1st) at 9:04 pm CDT. 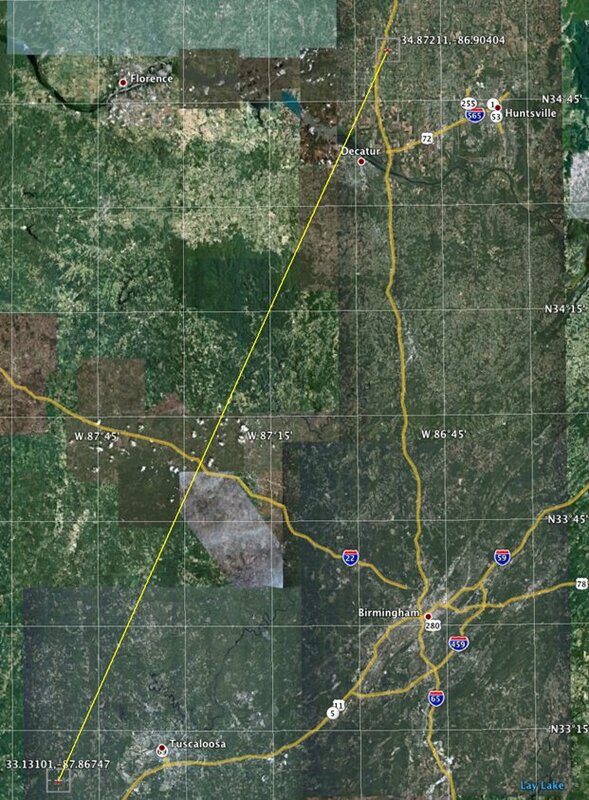 Blazing across the sky at 40 miles per second (144,000 mph), the 1 inch visitor from space took only 3.3 seconds to go 132 miles, starting at a point just northeast of Athens, Alabama and burning up west of Tuscaloosa. Author Marshall Space Flight CenterPosted on November 3, 2011 May 23, 2013 Categories UncategorizedTags allsky camera, astronomy, Bill Cooke, Marshall Space Flight Center, meteor1 Comment on From Athens to Tuscaloosa — In 3 Seconds!